As St. Patrick’s Day approaches in March, Irish music can be heard in many venues – especially in crowded, boisterous bars, where the songs have to compete with loud conversations. For those who prefer a more civilized setting, McLaughlin’s Alley band returns to Barefoot Productions on Main Street in Plymouth for an evening of Irish music on Saturday, March 7th from 8-10 p.m. Audience members can relax in Barefoot’s plush seats and listen to Irish favorites such as Black Velvet Band and Wild Rover, as well as lesser-known tunes like Mary from Dungloe, a wistful song about immigration and leaving loved ones, and Old Maid in the Garrett, a hilarious take on spinsterhood. 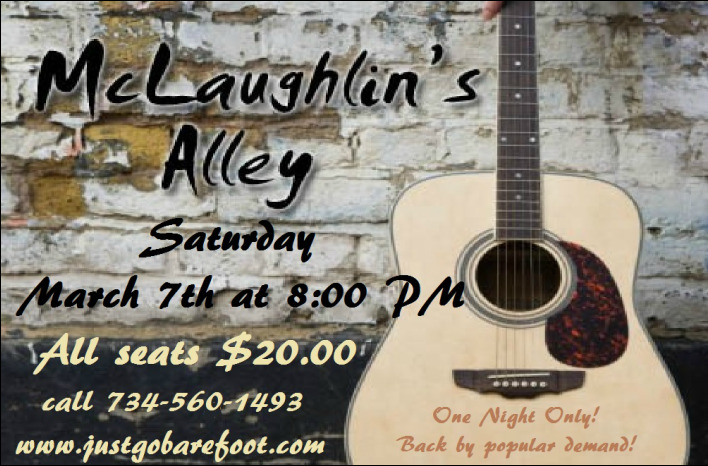 McLaughlin’s Alley consists of Maureen Paraventi on vocals and flute; her sister Tina Paraventi on vocals and guitar; Stuart Tucker on drums, Norm Andresen on bass and Rebekah Poxson on vocals and ukulele. The band is known for its rich harmonies and lively performances. 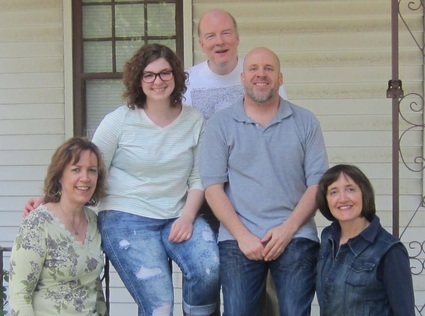 The McLaughlin’s Alley repertoire includes rock and pop covers and original songs, but its roots are in Irish music. Tina and Maureen originally formed an acoustic duo playing Irish music in local pubs as the McLaughlin Sisters (McLaughlin was their mother’s maiden name) before expanding into a full band. “The great thing about this music is that you don’t have to be Irish to enjoy it” says Paraventi. “Its appeal is universal, because it tells stories and strikes emotional chords that resonate with everyone. It either has you laughing out loud or crying in your beer.” The concert will include rousing numbers like Whiskey in the Jar and Goodbye Mrs. Durkin, a particular favorite of the band, as well as the poignant Fields of Athenry and the playful Gypsy Rover, which tells the story of a young woman who runs off with a man her father doesn’t approve of until (spoiler alert!) Dad discovers something which changes his mind. Singing along is encouraged, and a new element er will facilitate this by projecting lyrics to some of the songs on an overhead screen, so people who sort of know the words to Danny Boy, McNamara’s Band, Toora Loora Loora and others won’t have to guess at them. And if you want to take the music home with you, McLaughlin’s Green, the group’s CD of Irish songs, will be for sale in the lobby. WHEN: Saturday, March 7, 8-10 p.m.
TICKETS: $20. Buy them at the door or online (www.justgobarefoot.com). For more information on McLaughlin’s Alley, visit: www.mclaughlinsalley.com.